We have amazing employees! We are honoring our talented employees with Employees of the Year Awards, nominated by their peers, for their outstanding work and helping others to think globally and offer limitless choices. Employee groups honored are: Admin Support, Custodian, Food Service Department, Secretary, and Teacher. Custodian of the Year, Larry Rockett: Why does Larry Rockett deserve to be Custodian of the Year? Mr. Rockett knows the students and is always willing to help out. The students respect him and look up to him. His nominator writes, “My 4-year-old and 2-year-old have seen and talked to him over the summer and school events and for about a year called him “The Rocket.” They are upset if he isn’t at school. Some of my 4th and 5th graders think he would be a great teacher and are excited to say hi to him in the hallways.” Mr. Rocket is just really nice to everyone – even while cleaning bathrooms and gross messes. Mr. Rocket is a positive presence at the Dr. Walter Cunningham School for Excellence. He makes desks and chairs the correct height, finds desks for classrooms, cleans messes, says “Hi” to everyone, unlocks the building for us on some weekends, and helps in so many ways to keep Cunningham looking great! 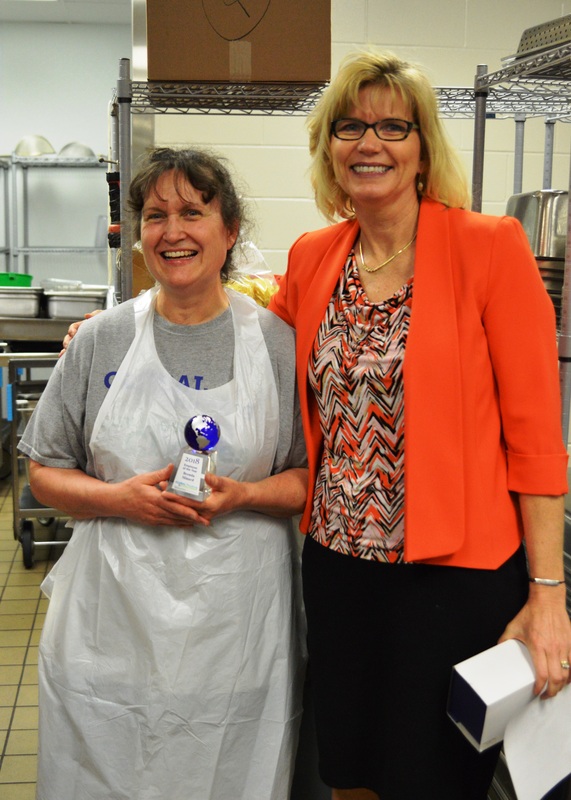 Food Service Employee of the Year, Brenda Minard: Why does Brenda deserve this honor? 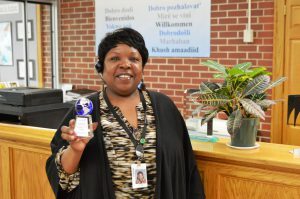 She received the most nominations this year of any Waterloo Schools employee, SIX! Here are some of the numerous nice comments shared about her: I have worked with her for a while now and I have never worked with someone so kind, respectful, or hardworking. She really cares for everyone and is a very nice person. Brenda is a very dedicated worker who gets perfect attendance awards, even after working at UPS all night. Brenda comes straight to Hoover for her 2nd job. She always walks in with a smile and a “hello everybody”. Brenda is willing to do anything that is asked of her. She always comes in with a smile and has a good attitude. She is a team player and a joy to work with. Brenda is one very hard-working woman. She is amazing with students and always addresses them in a kind tone with a smile on her face. She really cares about her colleagues and the students. Brenda always gives 110 %. Her pans are scrubbed so clean, nothing slides on or off of them. I’ve never experienced such an ecstatic worker before, she’s consistently happy and helpful and always does her job so perfectly that even the greasiest of pans don’t slip and slide after she finishes her job. 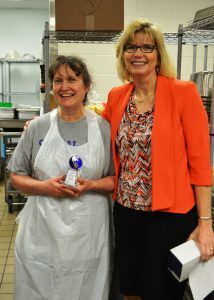 If anyone deserves this award it would be her, even though she’s “behind the scenes” in the kitchen she never fails to be dependable, adaptable, and friendly or funny. I find myself constantly looking at the door waiting for her to arrive. Elementary Teacher of the Year, Amy McGovern: Why does Amy deserve to be Teacher of the Year? Amy is described as someone who has the biggest heart, which overflows daily with love for students and staff. She always brings a fresh perspective to the table, making sure ALL students are able to be included, involved and challenged. 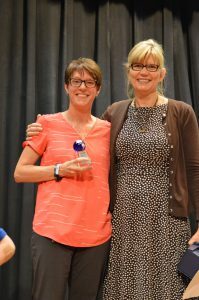 Her nominator write, “Her ideas are transforming the climate of our school, by encouraging us to go from “Me to We.” Amy’s energy is contagious. She advocates, supports and “fights” for every student, regardless of the amount of interactions she has had with them. 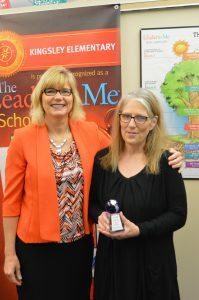 Amy was the mastermind behind Lou Henry’s first Kindness Day. She not only applied for the Project Jack grant, but also sought other donations to give back to our community. 630 acts of kindness were done that day, and so many benefited. EVERY student was able to participate in this day; which was awesome. She has also brought great ideas for Leader in Me, to ensure every student has a leadership job. Kindness and inclusion are so very close to Amy’s heart; it is apparent in her teaching and life. Congratulations to Amy McGovern, Teacher of the Year! 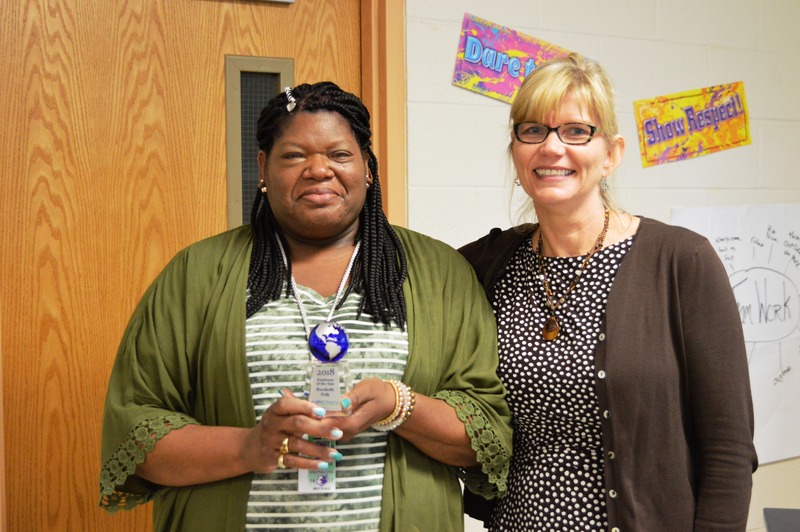 Para Educator of the Year, Rocshelle Polk: Rocshelle has been with Waterloo Schools for over 20 years. She supports and cheers students as they meet and surpass goals. She is a daily reminder that each child, no matter how difficult they might be, deserves the best that we have to offer. One of her nominators writes, “Rocshelle is a beacon of light when times are tough and things become overwhelming, as it sometimes can be in education…dealing with the daily chaos that some of our students live in, the life issues these students have no choice over… She reminds us that despite all of these outside influences we can make a difference.” Another nominator writes, “Rocshelle knows the curriculum so well that she is able to assist the teachers with ideas of how to modify things to ensure students are succeeding. Rochelle knows how to calm students down if they are upset. If adults are having a bad day, Rochelle will come around and cheer them up. She is just the best!” One of her former students said, “She told me I could do things that no one else thought I could do and I love her for that.” Congratulations, Rocshelle Polk! Teacher of the Year, Justin Decker: Why does Justin Decker deserve to be an employee of the year? One nominator writes, “He has turned around the atmosphere in athletics at East High. His dedication to students and the strength and conditioning team is amazing and incomparable. He started in 2015 during a three-year losing streak but chose to stick by those kids to get them better prepared.” Justin attends each football game and was able to see those freshmen get their very first win as seniors. His drive and dedication are amazing! He still offers advice to young men that have graduated from East but return to lift and get help from their “gym dad” as they call him. A student who nominated Justin writes, “He acts as a gym dad to those students that need a man’s advice. 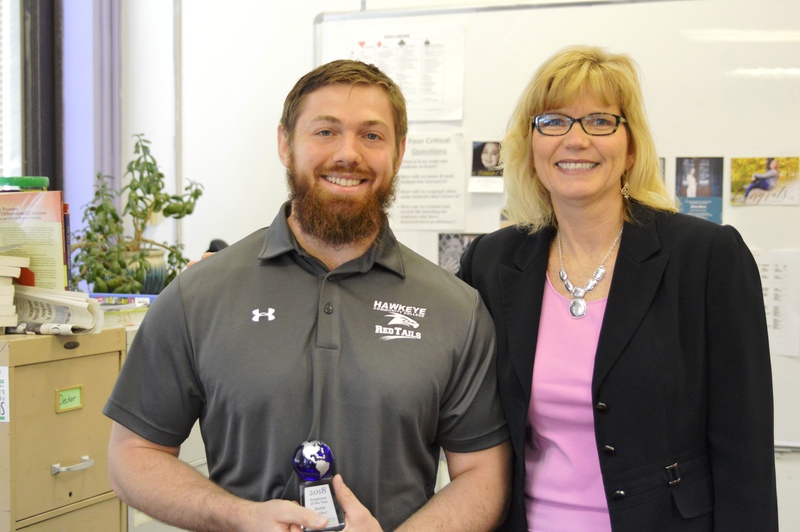 He is a friend but makes them work hard to reach their final goals.” Congratulations to Justin Decker, Teacher of the Year! 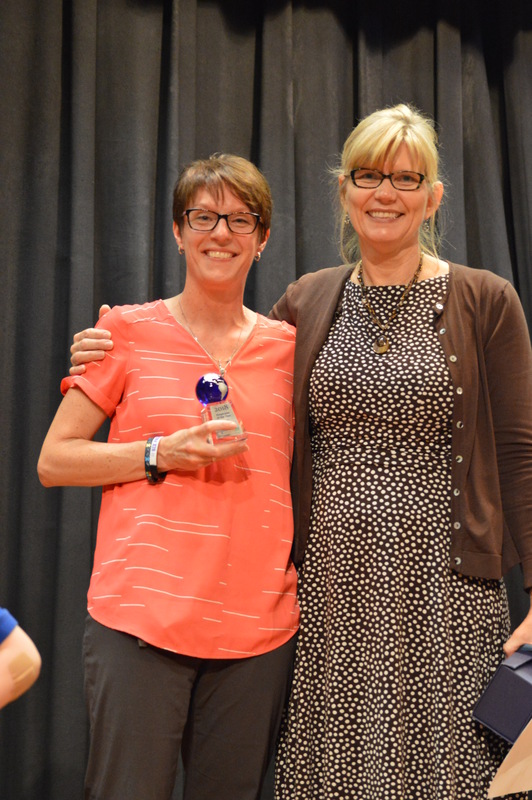 Secretary of the Year, Julie Danker: Why is Julie Danker Waterloo Schools Secretary of the Year? Julie’s nominator writes, “We couldn’t ask for a better person than Julie to be the first one that visitors meet when they come through the doors of Kingsley. Her warm and friendly demeanor is very welcoming. Julie makes everyone’s job easier and she is always willing to help. She is knowledgeable about what goes on in the school and if she doesn’t know something, she will find the answer. She is extremely patient with both kids and adults, even when times get busy. We are very fortunate to have Julie at Kingsley.” Congratulations, Julie! Click here to nominate a deserving employee. 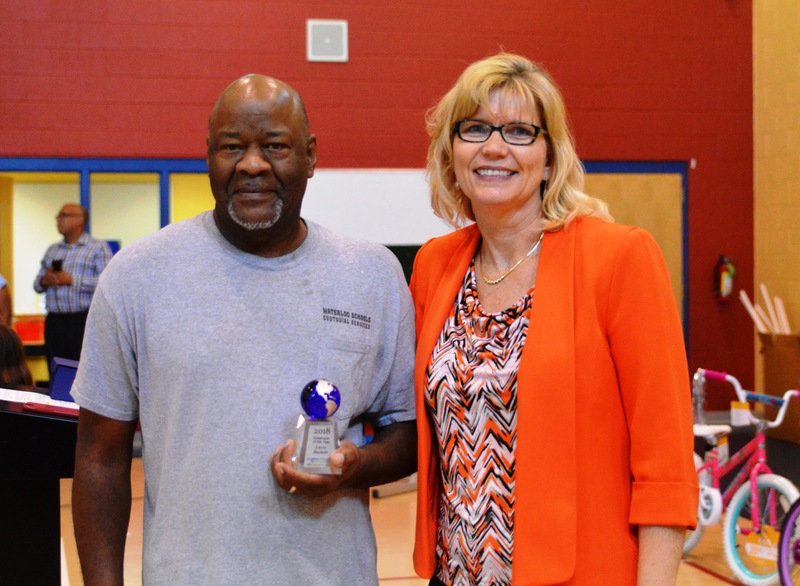 Click here to see past Employees of the Year winners.